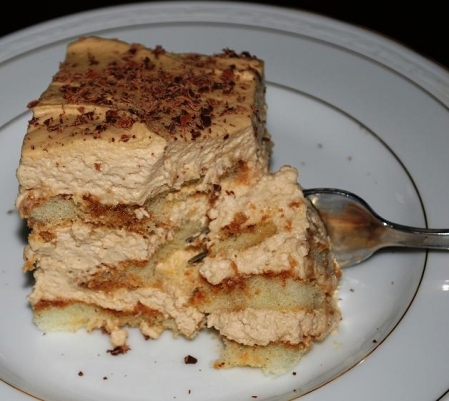 Don’t be intimidated by this sinfully delicious Italian dessert, it is very easy to make. It may look like a lot of ingredients and steps, but it can be whipped up in about 30 minutes (that is how long it took me) and is a great make ahead dessert. Normally espresso is used, but I wanted a little different take that added more of a chocolate appeal and used General Foods International® Suisse Mocha. Actually that was for my husband who is a chocoholic. Serves about 8 depending on how big you cut the pieces. Remember it is very rich and creamy and a little goes a long way – enjoy! See Chatty Advice for some options in making this dessert. In a small to medium bowl whisk together dipping mixture and set aside. In a large bowl using a mixer, add all mascarpone cream ingredients and mix until well blended. Set aside. Place a medium bowl in the freezer for 5 minutes, remove and add cream. Using a mixer beat on high until soft peaks form. Add sugar, Kahlúa and vanilla and beat for about 2 minutes or until medium peaks form. Do not over beat. Add mascarpone cream mixture and mix until well blended. In an 8” x 8” x 2” pan or glass baking dish start to assemble, by dipping lady fingers into dipping mixture and arrange in the pan/dish. Top with cream mixture, add a second layer of ladyfingers dipped in dipping mixture, top again with cream mixture add a third layer of lady fingers and top with the remaining cream mixture. Refrigerate for about 2 hours or longer. When ready to serve garnish with grated chocolate. I made this dessert with the crisp lady fingers as well, so if you can’t find the soft ones the crispy ones will work too. If you do use the crispy kind use a little more of the dipping mixture and allow it to sit for at least 4 hours or longer for the fingers to moisten. If you can’t find any lady fingers a mild sponge cake will work as well.